Why are my teeth yellow? They say that a smile is a curve that sets everything straight. But, what if the same becomes a source of embarrassment for you? Apart from being one of the most common dental issues faced by people, yellow teeth can make any person feel embarrassed or diffident. So, what are the factors that affect the color of your teeth? While most people understand that smoking carries severe risks to health, a very few people know that it is even bad for the teeth. 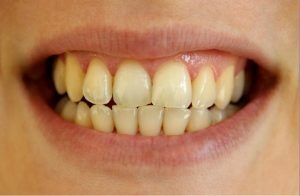 People usually have those yellowish stains on the teeth because they smoke tobacco products such as cigars and cigarettes. The teeth have that yellowish look because of the accumulation of stains from nicotine, tar and other chemicals that are present in the smoke. There are certain beverages and foods that can stain your teeth as they contain tannins and dyes. Some examples include soda pop, tea, coffee, popsicles and soy sauce. Having these foods in excessive amounts or skipping brushing after consuming these foods can even lead to permanent stains that can’t be reduced from regular brushing. Did you know that there are certain prescription antibiotics like tetracycline that can lead to permanent yellowish or grayish stains on your teeth? So, it is best to make sure that you discuss the side-effects (staining effects in particular) of the prescribed antibiotics with your doctor. Your genes are a major factor that affects the color of your teeth. People with their parents having naturally yellow teeth are more likely to have the same colored teeth. Well, this is one of the most obvious reasons for having stained teeth. Plaque builds up on your teeth as a result of poor hygiene gives them the yellowish or mottled look. There are different factors that affect the appearance of your teeth but these problems can be resolved by bringing certain changes to your lifestyle and seeking the help of a reliable and profession dentist. At Brighton Implant Clinic, our dentists focus on finding specific solutions that counter the particular kind of stain you’re facing.